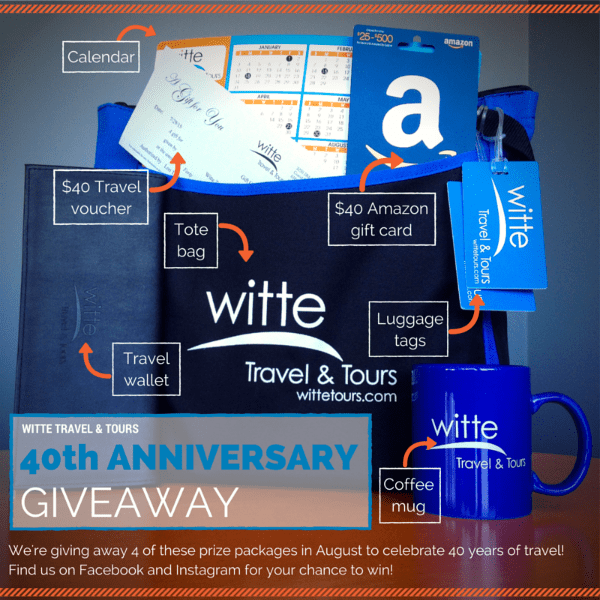 Witte Travel & Tours Turns 40! August 2015 marks our 40th year of sharing the world with others. We’ve come a long way since Henk Witte first started Witte Travel in the basement of his home in Ada, Michigan in 1975, and to celebrate this anniversary, we want to give you– our fellow travelers and travel-lovers — some great prizes to thank you for your support during all these years. So, this month we’ll be running weekly contests on Facebook and Instagram. Each week, one winner will receive a fantastic prize package that includes a Witte tote bag, a leather travel wallet, a coffee mug, luggage tags, a 2015/2016 calendar, a $40 gift card to Amazon.com, and a $40 travel voucher that can be used for future tours, airline tickets, or cruises! All you need to do for your chance to win is to participate, so be sure to follow us on Facebook (www.facebook.com/wittetravel) and Instagram (@wittetravel)! We’ll announce each week’s contest winner on Fridays. We look forward to another 40 years of traveling the world, and we hope that you’ll join us!